The inaugural season for the CRASHCar division is quickly coming to a close, but the full field of character-named racing machines saved its best finish thus far for the 20-lap CRASHCars Tournament of Thrills event on Saturday night at the Dirt Track at Lowe’s Motor Speedway. Four cars came off the final corner door handle-to-door handle, trying to take advantage of the pre-race twist brought on by track officials, but the No. 76 “Patriot” entry for Terry Plott was declared the winner in an epic finish. In most forms of stock car racing, the first car to cross beneath the checkered flag takes the race win. Not so in some CRASHCars feature events. Before Saturday’s 20-lap feature, series director Roger Slack passed word along in the driver’s meeting of an inversion of the top-three finishers at the line. The third car to take the checkers would be declared the winner, while the first car across would be dropped to third. This threw a curve to Plott, but he was still able to lead from the pole position and strategically backpedal on the final lap to finish in the winning position of third. 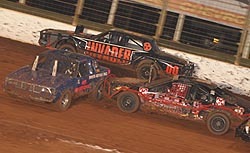 “The Enforcer” slowed the lead pack for five laps and allowed point leader Kenneth Deese in the No. 3 “Big Show” car to pass the “Invader” No. 00 driven by Paul Sparrow for the third and winning position. Sparrow recovered and quickly came back through and regained the first position on the track as Plott’s “Patriot” tried to position himself for the win. Four cars had a shot at the win as the white flag flew, leaving them all jockeying for the coveted third spot. Contact was made through the final corner and the top four cars were side-by- side to the checkers. When they hit the stripe, it was Plott in “Patriot” that maneuvered to the third spot, capturing his first-career win. "The Invader" led a good portion of the race, but couldn't grab the win. (Erik Perel photo). “It was close,” said a disappointed Sparrow after crossing the line first, which relegated his “Invader” car back to third in the final rundown. 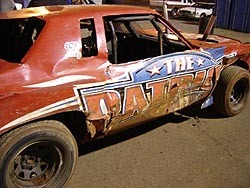 Plott and his “Patriot” ride took the green flag in front of thousands of excited fans at the CRASHCars Tournament of Thrills and immediately took off ahead of the field. He continued to set the pace until “The Enforcer,” a souped-up CRASHCar whose sole purpose on the track is to ensure that the leader does not check out from the rest of the field, made an impact on the race for the first time at the halfway point of the race. Behind Plott in the final rundown were Gene Loden in “Salvage,” Sparrow’s “The Invader,” and Deese’s “Big Show, while Walter Pecora in “Krashy the Klown” rounded out the top five. The CRASHCars returned later in the night with the Trailer Race of Destruction, where the CRASHCars towed trailers, boats, and sometimes boats without trailers, around the track. The last one with a trailer and/or boat to finish at the end of the timelimit was declared the winner. And to no one’s surprise, CRASHCar point leader Deese and his “Big Show” entry took the checkers towing his trailer, perfectly matched up with the color scheme of his #3 ride. Doug Meyer won the Waterless Boat Race portion of the trailer race, towing a ski boat behind the Miss Demeanor machine. 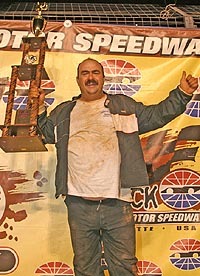 Kenneth Deese won the CRASHCar Trailer race. (Erik Perel photo).